Militants are said to have killed at least 35 people, including 17 children, at a mosque near the Pakistani army's headquarters in Rawalpindi. At least four attackers opened fire on worshippers during Friday prayers attended by many military staff in the garrison city. Security forces fought back in an hour-long gun battle before three attackers blew themselves up, reports say. The Pakistan Taliban later said they had carried out the strike. This attack happened inside a so-called red zone, supposed to be a very secure location. It is close to military facilities and in an area where many senior army officers live. They were known to attend this mosque for prayers. Once again, the militants are taking this fight to the army and showing they can strike inside a secure protected location. Certainly, this is part of a pattern of targeting military and security sites. It is something not only restricted to Rawalpindi, but happening in other Pakistani cities as well. Ten adult civilians were also among the dead, as well as military staff, the army said. 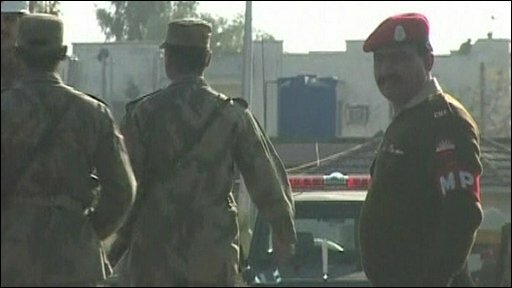 The Pakistani security forces have been attacked recently, and this attack has shown that the militants can still penetrate supposedly secure areas, says the BBC's Orla Guerin in Islamabad. One witness told Pakistan's Dawn TV: "They attacked the mosque from the side ... the windows. They took the people, got hold of their hair, shot them." The attackers reportedly started hurling grenades around and firing indiscriminately, before two were killed in the battle with security forces and two blew themselves up. Military spokesman Maj Gen Athar Abbas said the latest attack had been co-ordinated. It ended once the military had made sure all the gunmen were dead, AFP news agency quoted him as saying. Interior Minister Rehman Malik said explosions from at least one suicide bomber caused the roof of the building to collapse. "They are taking revenge for the Pakistan army's successful operations in the Swat and Waziristan region," Mr Malik told the ARY television channel. One witness, Nasir Ali Sheikh, told the BBC he had seen three attackers, one of whom threw hand grenades into the mosque. He said two grenades had landed in the men's section of the mosque and one in the women's. Other attackers were firing randomly in the Parade Lane mosque, said Nasir Ali Sheikh, adding that visitors had had to go through tight security, including metal detectors, to get inside the building. "As soon as we finished prayers, I heard a blast and firing," witness Bakhtawar Hussain told Reuters. He said he had seen wounded people lying in the courtyard of the mosque. Police cordoned off the area around the mosque. The mosque is a short distance from the army headquarters, in an area housing several offices of the defence establishment and the intelligence agencies. Nineteen people were killed in an army base attack in Rawalpindi in October. There has been a pattern of militant groups trying to attack security targets inside Pakistan recently as the army pursues an offensive against militants in South Waziristan.